It’s a big industry, it’s a big city, and now and again you find yourself being constantly asked to donate to a specific charity. Be it the grocer, telemarketer, mail, email or even a Facebook event invite. Now I’m not saying not to donate to a good cause but half the time we wonder if our loose change will even do any good or even get to the actual charity! Growing up, I always made my parents drop cash into the Salvation Army bins, give homeless beggars whatever coins they had in their pockets and so on. And, even when I couldn’t afford it, I still had at least 50 cents on my person somewhere. I’ve seen celebrities and people of importance hold huge galas and events in honor of some sort of remarkable cause. Though those events are quite glamorous and expensive, I’ve never let their extravagance deter me from doing something similar. In fact, that’s where this story unfolds. In my time in the entertainment industry, I’ve done everything from fashion shows to photo shoots, music videos and filming. As a make-up artist I get a good feel of behind the scenes and the inner workings of production, but a make-up artist doesn’t leave much of a mark. That’s where cosplay and charity come into play. These days I use cosplay and my entertainment biz networks along with friends and branding to produce and consult charity events. My first big drive was a kids’ costume drive I ran for my old Roller Derby League, Sugartown Roller Girls, up in Ventura County in 2010. We collected over 75 costumes and donated them to the Arc Foundation. They were presented to the kids and later on they had a trick or treat trunk event. Before I was in the biz full time, I was in Food and Beverage Hospitality Management as a training manager and event planner. I spent years focusing on events, themed parties, etc. In fact, to this day, though that was 3 years ago, I am still called upon to come up with party and event proposals. I’ve been able to produce screenings, premiere parties and themed events around a charity. Last year I was invited to a panel on “ Organizing Your Geek Culture” where I was honored to meet, over tea, a young lady who was in need of my expertise. Several months later, I came on board to consult the Tomo Neko Maid and Butler Café event benefitting the Trevor Project, an organization that means a lot to me personally. 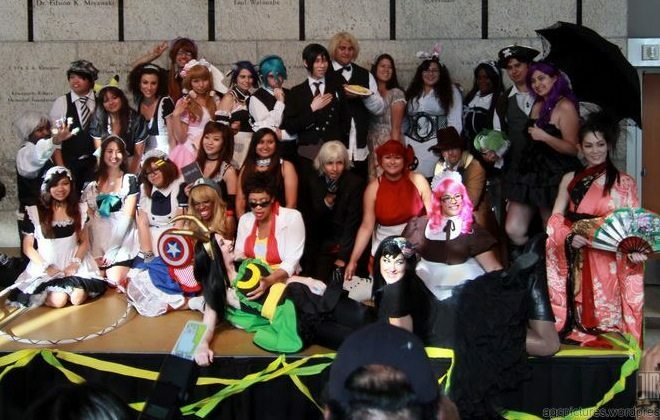 We attached Chocolate Covered Cosplay and Nerdy-Girlz to the event, and that alone generated some buzz for both organizations’ participation in charity events. I was just happy to spread the word. You see, wrangling cosplayers and talent is one of my many skills and I cannot help but be that resourceful. Especially for kids! Through your brand, name, website or business you can leave an everlasting impression through charity. You can still have your parties, your mixers, galas, screenings etc., but if you spend a little time applying some planning, skills, and resourcing to your next big event, you aren’t hurting anyone and the time won’t be wasted. Folks are going to spend money, and it’s up to you to figure out how to tell them where they could be spending it. No different from a Kickstarter or Indiegogo campaign, you can attach yourself to a charity or organization of your choice to the drive and really draw some positive attention. The press loves it, the charities love it, and you will too. For example, last December I coordinated a food drive/sorting day with the LA Food Bank for YouTube talent, Hannah Hart (of “My Drunk Kitchen”). We had almost 100 fans sign up and join us for several hours one Saturday morning. We recorded the event and documented it for her national tour and she has done more charity events since. This year, my partner and I are producing a charity event at a local bar in Valley Village for another kids’ costume drive. With Halloween just around the corner, it’s a perfect event/charity pairing: we’ve teamed up with some amazing voice actors and talent to do live readings of the classic Scary Stories To Tell in The Dark series by Alvin Schwartz with art by Stephen Gammell. Organizing your event can be tricky. You’ll always need to start with a list and go from there. Think hard about where you’ve attended events. I log venues that have appeal, might not cost much to rent, have great parking and a lot of event potential. Make contacts with event planners, event companies and party rentals. Even if you won’t ever use them, it’s good to have those contacts – and good for them to have you and your talents on file as well. If you’re doing a premiere that’s based around a certain genre, context, or theme, think about how you might attach a charity drive to that event. And remember, it’s important to know that if you are doing a charity event often times you can easily get sponsorships and free items for your event. There are several “Top 25″ lists for Children’s charities, one is “More For Kids”. However I’ve been known to stick to smaller local women and children’s shelters such as The Arc Foundation of Ventura County, but there’s a great list you can narrow down on: http://www.womenshelters.org/cit/ca-los_angeles . Speaking of which, the choice of charity is all yours. The main reason I run the kids’ costume drive is because I love kids and Halloween, it’s pretty simple. I am passionate about opportunity and this kids’ costume drive is just that: my opportunity to make a difference to set an example and change the world. Well, not entirely, but a girl can dream right? Whereas, a friend of mine, Christina Diaz, took action and created Ink For a Cause, a tattoo expo which she runs annually up in Ventura County. Remember it’s not how much you think you can make at a charity organization but the effort behind it; the love and work that goes into it and the reward of bringing awareness to the event, the organization and your brand/name. So please, if you want to create a drive for some cause and not sure where to start I’m available to help you along the way. After all I was given the name “Charity Whore” for a reason. Born and raised in Southern Ca, Chrissy Lynn had an eye for design and detail. As a cosplayer and designer she thrives on perfecting her craft and learning new techniques in hair styling, special FX makeup, prop and fabrication as well as costume and wardrobe. Her passion for the arts growing up has lead her to the Los Angeles area taking on positions in film/television, new media and marketing. In between working, Chrissy actively participates in non-profit charity work be it coordinating/planning, events/donation drives, cosplaying or digital marketing. She thrives on networking and making introductions. You can call her a matchmaker for collaborators as she firmly believes that artists should work with other artists and make s**t happen! She currently co-runs Nerdy-Girlz.com, a site dedicated to lady geeks in the community who regularly participate in cosplay photo shoots, charity events, comic conventions and more.